Obituary for Doreen Helena Baker | Westlock Funeral Home & Crematorium Ltd.
Doreen Helena Baker(Haase) was born December 27, 1935 in Hanna, Alberta. 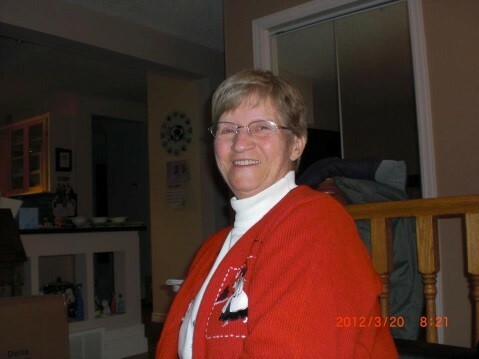 She passed away at the Wildrose Villas (Boyle, Alberta) April 12th at the age of 83. She was the eldest daughter of Robert and Helena Haase. Mom was the eldest of six children, Robert, William, Eugene, Annette (Oesch), Betty Lou (Tomlinson), and her ‘sister’ Lee (Penner). As a baby the family moved to Hondu and at the age of 10 moved to Abbotsford BC, before settling in High River at the age of 13 where she graduated from High River High School. She married Allan Baker (Perryvale) December 1954. They lived in Calgary for many years and had five children. Cleo Burge (Grant), Bryan, Robyn Safar (Don), Wendy, Kari Baker (George). Doreen is survived by six grandchildren and five great grandchildren and pre-deceased by her husband Allan and great grand child Brian Laver/Burge. While in Calgary Mom was a Girl Guide Leader for sixteen years and worked as a teller with CIBC. Doreen and Allan moved to Perryvale in 1976 where Doreen worked at the CIBC before retiring from the Athabasca Health Unit. Doreen and Allan were involved with the Athabasca and Rochester Senior Clubs and spent many an afternoon playing cards. A second celebration of life will be held in Calgary June 1st at the Centennial Calgary Branch Legion #285, 1:00 – 3:00. In lieu of flowers donations can be made to the Alzheimer Society of Canada. There's still time to send flowers to the Celebration of Life at the Perryvale Hall Community Hall at 1:00 PM on May 11, 2019.